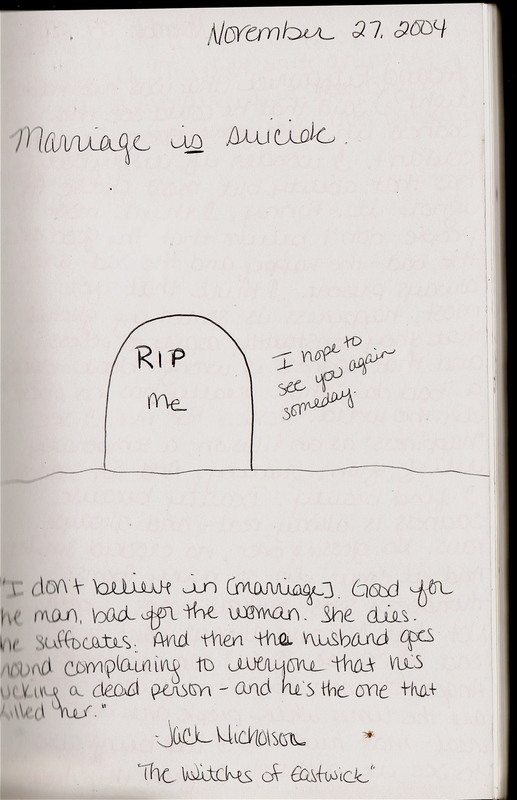 “Marriage is suicide.” I believed I’d lost myself completely. At the time I made this entry, I had been married for a little over a year. And still, I would remain married for another 6 months until circumstances merged and I had a reason to file for divorce. Why do people stay unhappy for so long? Why is marriage truly suicidal for so many people? I know many who have taken various routes of escape: dangerous affairs, alcohol, drugs, fantasy football, prolonged sleep… but they wouldn’t actually leave. I’ve heard lots of explanations too: people stay together for the kids, the house, the finances, the holidays, soccer season…. or the hope (without action) for the relationship to improve. Are these really noble motives? Or are they simply excuses for doing nothing- for remaining miserable because misery has become such an expected state of existence? I think it’s often a comfort issue… because leaving means venturing into something different. And for some reason, we fear “different” more than we fear “life-threatening”. I suppose too, that some are addicted to the drama of a volatile marriage: If we break up, who would I fight with? How else am I going to feel so alive? Ah, but the truly abusive situations are another story altogether. Tonight, I was thinking mainly of those who plainly coexist. The ones who quietly fantasize about the life they could be living if they weren’t tied to the person they share a passionless bed with. That’s the dull pain I remember clearly and am so thankful to have left behind. It’s these people to whom I want reach out with encouragement. Posted in divorce, marriage, Personal Favorites and tagged divorce, marriage, unhappy marriage. Agreed, Lauren. Myy home life improved dramatically when my parents were no longer at each others throats under the same roof.